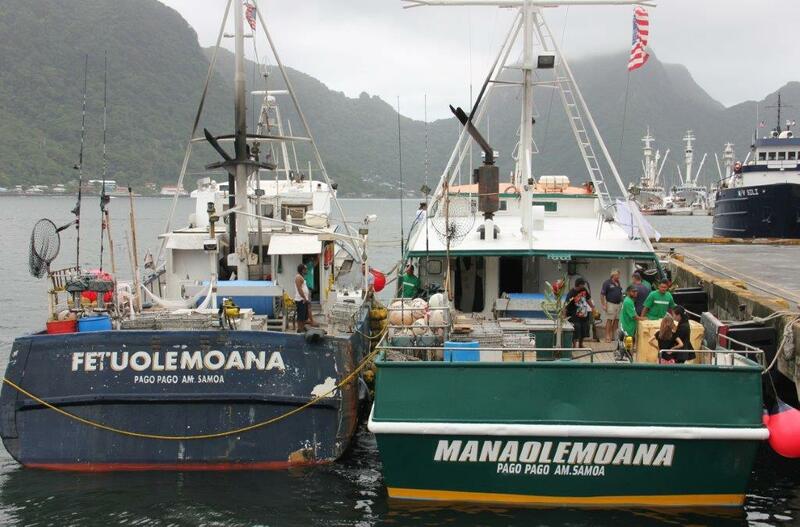 HONOLULU (29 January 2016) Effective today, US federally permitted longline vessels in American Samoa that are over 50 feet in length can fish for pelagic species in certain areas of the American Samoa Large Vessel Prohibited Area (LVPA). The National Marine Fisheries Service (NMFS) announced the final rule, which will publish in the Federal Register on February 3, 2016. Local US longline vessels at Pago Pago harbor. The LVPA, which extends out to 30 to 50 nautical miles from shore around the islands of American Samoa, prohibits vessels greater than 50 feet from fishing within the area. 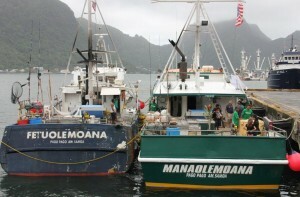 In 2015, the Western Pacific Regional Fishery Management Council (Council) undertook decision-making to amend the applicable federal LVPA regulations to provide an exemption to large vessels in the American Samoa longline fishery to allow them to fish seaward of 12 nautical miles from shore around the islands of Tutuila, Swains Island and the Manu’a Islands. Fishing around Rose Atoll Marine National Monument remains unchanged. The LVPA was developed by the Council and approved by NMFS in 2002 to prevent potential gear conflicts between large and small fishing vessels. At that time, approximately 40 alia longline vessels were operating in offshore waters around American Samoa. Originally used to target bottomfish, the alia vessels range from 25 to 40 feet in length and have a catamaran hull. Since 2002, the alia longline fleet in American Samoa declined to the point where only one alia longline vessel was operating in recent years. In 2014, the Council proposed opening the LVPA as a means to assist the larger US longline vessels based in American Samoa. The US fleet was experiencing financial difficulties attributed in part to market competition resulting from an influx of Chinese longline vessels in South Pacific albacore fishery. In making its decision, the Council noted that the National Standards of the Magnuson-Stevens Fishery Conservation and Management Act require the achievement of optimum yield and the fair and equitable allocation of privileges. The Council took final action on the measure in March 2015. The exemption will be reviewed annually by the Council to take into consideration any new small vessel fisheries development initiatives, small vessel participation and catch rates. Council Chair Edwin Ebisui Jr. noted that the measure is important to maintain the supply of US caught albacore from the local longline fleet to the Pago Pago-based canneries in American Samoa. The exemption will improve the viability of the American Samoa longline fishery and achieve optimum yield from the fishery while preventing overfishing.